The nervous and heavily battered domestic equity market is eagerly waiting for the biggest business and economic event of the year - the Union Budget 2016-17. Even as most analysts gave thumbs up to the Rail Budget announcements, it hardly brought cheer on investors' faces. Analysts now expect the Union Budget 2016-17 may also turn out to be a dull affair amid shaky economic conditions, as government would walk on a tightrope to strike a balance between the industry expectations and fiscal prudence. And if history is any indication, they might well be right. 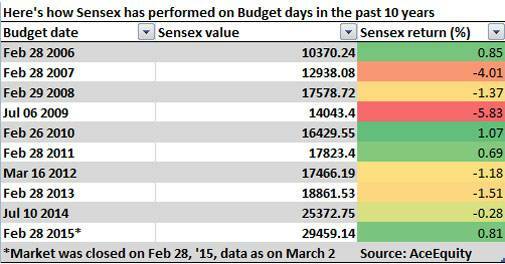 An analysis on Sensex movement on Budget days in the past 10 years suggested that the market has fallen more often than rise on Budget days. This holds true in seven out of 10 times. In 2015, Sensex did end with gains of 141 points, but only after plunging over 700 points intraday. The market was closed on February, 28, 2015, the day of Budget announcement. The index resumed trade on March 2, only to find huge volatility. It though managed to end 0.81 per cent higher for the day at 29,459.14. Soon, riding on the Reserve Bank of India's surprise rate cut the index hit its all-time high of 30,021 on March 4, 2015. Prior to 2015, Sensex tumbled for three consecutive years from 2012 to 2014 and shed 1.18 per cent, 1.51 per cent and 0.28 per cent, respectively. The year 2009 budget day was the worst for stocks as the index fell around 950 points during trade and settled the day with losses of 870 points or 5.83 per cent. In 2007, the Sensex crashed 678 points even before Finance Minister P Chidambaram rose to present the budget, and ended at the then four-month low of 12,938.09 points, a net loss of 540.74 points, or 4.01 per cent. As we head towards the big budget day, Dinesh Rohira, Founder & CEO of 5nance.com sees Sensex to test around 22,600 levels, in case finance minister Arun Jaitley fails to present a bold budget. However, experts believe markets will not entirely be guided by Budget announcements this year. Global cues will also play a significant part, they said. As the expectations are muted, Baliga does not see any major crack in the markets post budget unless there are specific anti-market measures. He expects Nifty is likely to remain in range between 7,000 and 7,600 over the next two months. With no near term political triggers except the passage of GST bill, the Nifty is likely to rule within trading range of 6,800-7,500 levels. Rohira believes Sensex and Nifty will hit 22,600 and 6,900 levels if government fails to come up with a bold Budget and follows the same footsteps as last two years. "Domestic markets will correct unless there are some bold reforms, like those in 1997 or 1991 budget, which may change the face of the economy or at least a budget that will promise a policy framework for bolder reforms in the coming future," said Rohira. The expert believes markets will be more dictated by the global risk uncertainties rather than Budget and will not move beyond 5 per cent in any direction from the current levels. "I see little reason why the risk-off in the global markets and also the reverse-flow from emerging markets will change in a hurry. We believe markets will move in the plus/minus range of 5 per cent post Budget," said Vora.